Has been a national correspondent for ESPN since 1995, covering the NFL for SportsCenter, Sunday NFL Countdown, ESPN.com and is the host of State Farm NFL Matchup on Sunday mornings in addition to hosting the EA Sports Match Up Show with Ron Jaworski and Merrill Hoge. He is a regular panelist on The Sports Reporters and Comcast Sportsnet’s Daily News Live. In addition to his expertise in covering football, Sal also covers Major League Baseball, NBA, tennis and special events and has received several Sports Emmys for his stories. He has also reported on World News Tonight and Good Morning America on ABC-TV as a special correspondent covering specials events such as the Ray Lewis murder trial, the Major League Baseball umpires legal dispute and the Marv Albert trial. From 1985 to 1995, he was a national political correspondent and sportswriter at The Philadelphia Inquirer. While covering local politics in New Jersey he was nominated for a Pulitzer Prize for his reporting that led to the first State Superior Court Justice in New Jersey being removed from the bench by the State Legislative for cause. As a Professor in the English Department at St. Joseph’s University he teaches courses in political and sports journalism. 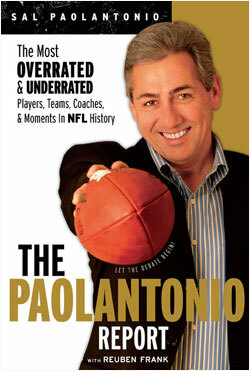 He is the author of two books: The Paolantonio Report: The Most Overrated and Underrated Players, Coaches, Teams and Moments in NFL History (Fall 2007) and Frank Rizzo: The Last Big Man In Big City America (1993), which was published in a tenth anniversary edition in 2003, It the all time No. 1 bestseller in Philadelphia.